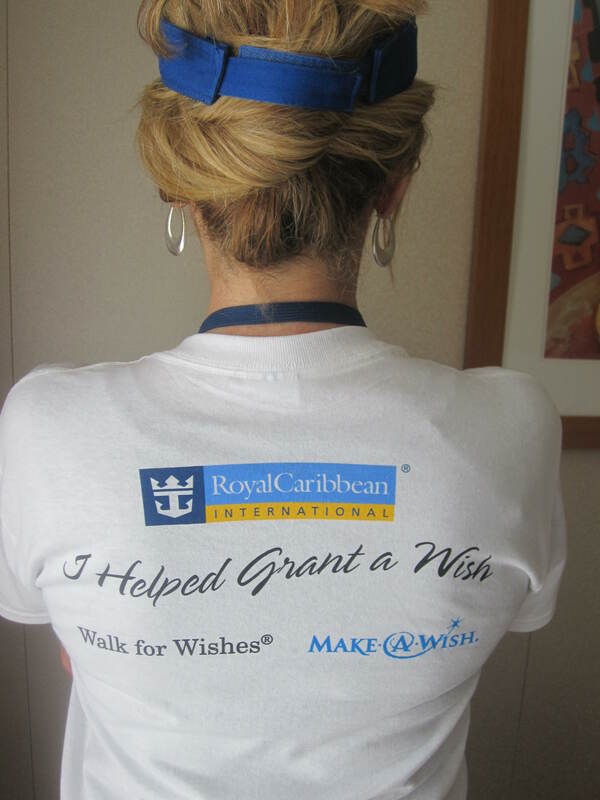 As part of their partnership with the Make-a-Wish Foundation, Royal Caribbean International were selling T-shirts for a donation of $10 each to go towards granting a wish for children with life-threatening medical conditions. 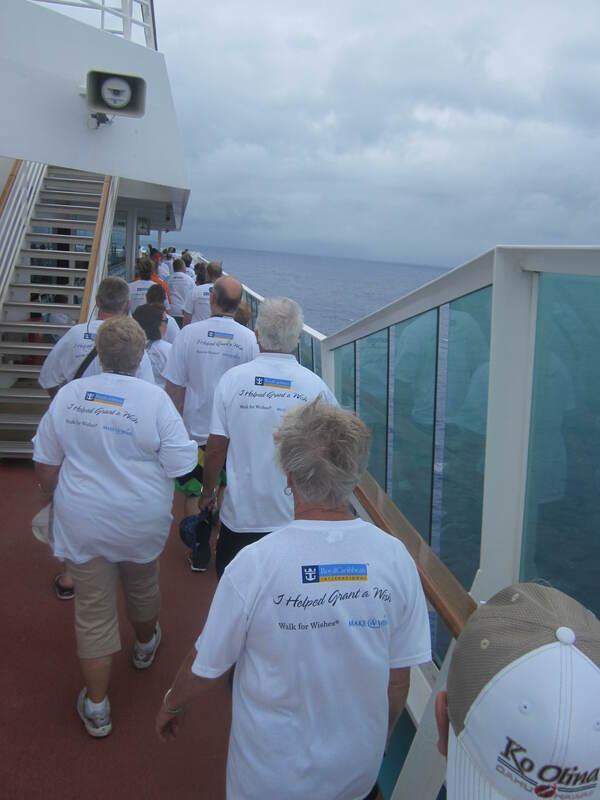 I took part, with us all donning the T-shirts, on the mile walk around the deck called the Walk for Wishes. Money raised on the ship exceeded $7,000. I was at a bit of a loose end while the rest of the group was playing Euchre, so I headed towards the gym on Level 12. Onto the reclining bike I climbed, ready for about 20 minutes of cardio. Jason Chase, the comedian who had performed the prior evening walked past, so I congratulated him on his show. He got on the bicycle next door and we proceeded to chat about insights into human nature, relationships and writing. I particularly liked the part of his routine about “rules” because I am often making up rules of the house, as well as rules for myself. Then we spoke about taking the lift, or elevator, up to the gym, and I mentioned the way we drive to the gym, and even try to get a parking spot nearby. He can park in the handicapped parking spot because of his wife’s health, but tries not to do that when she is in the car, unless he happens to be buying items for her. I asked if he did a bit of a limp when he did that. He laughed and said I understood people well, a compliment I highly value. The next ten minutes flew past, and we even discussed the book I am writing, about a girl called Suzi with an “i” travelling around the world thirty years ago. I also told him about Phuket, where I designed a coat to be tailor-made in a charcoal wool. After my fitting I had later returned to collect the finished garment, when I saw a black jacket in exactly the same style hanging next to it! Apparently someone had seen mine and wanted one just like it, which therefore made me an international (though unpaid) fashion designer. He used to live in Las Vegas, so every time he headlined a cruise it could be announced that he was “direct from Las Vegas” which was true to the letter. It was a most enjoyable chat, and he even offered to critique my blog. This entry was posted in Royal Caribbean International Cruise, Travel, travelswithprincessandquiquinou and tagged Jason Chase, wishes at sea. Bookmark the permalink.